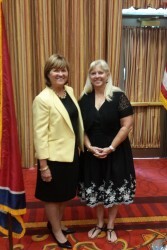 Judge Sherry Paty was introduced as the new president of the Tennessee Municipal Judges’ Conference during the group’s annual meeting in August. Judge Paty serves as Chattanooga Municipal court judge. She is a lifelong resident of Chattanooga, and has held the office of City Court Judge since 2004. Judge Paty is a graduate of the University of Tennessee at Chattanooga where she obtained her Bachelor of Science in Business Administration. Judge Paty then attended the University of Tennessee at Knoxville where she earned her law degree in 1989. In 2001, Judge Paty received her credentials from the Tennessee Supreme Court’s Commission on Alternative Dispute Resolution to serve as a Rule 31 Listed Family Mediator. Outgoing president, Judge R. Price Harris was honored by the conference with the Sharon G. Lee Award of Excellence for his outstanding service to the conference. The municipal judges’ board of governors created the award to be presented to a municipal judge who has made a significant contribution to the conference over the course of their service on the bench. The award is named in honor of Tennessee Supreme Court Justice Sharon G. Lee, who once served as the municipal judge in her hometown of Madisonville. Sharon G. Lee was appointed to the Tennessee Supreme Court in 2008 and re-elected in 2010 and 2014. From 2004 to 2008, she served on the Tennessee Court of Appeals.Justice Lee presented the award to Judge Harris. Judge Harris served as conference president for two years. As president, he worked with the Board of Governors and committees to ensure that the Municipal Judges’ Conference interests are continually served in the areas of legislation, education, and long range planning. Judge Harris received his BA and his JD from the University of Memphis. He has been the municipal judge for Gallaway since 2000 and has been a special judge for the City of Memphis since 2011. 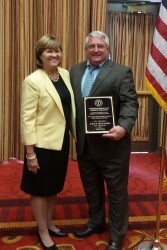 Judge Harris has served the Tennessee Municipal Judges Conference in many capacities. He has been the Conference’s Treasurer and Vice President, in addition to his service as President. He has also served as its Education Committee chairperson.